You Can Beat Cancer Too!! Gifts from the Ocean: Fucoidan - The Secret Behind the Miraculous Recoveries of Cancer Patients! Who would have thought a powerful "anticancer agent" would be found in the sea? A highly viscous material, fucoidan awakens the body's natural healing power-or in other words, the immunity- in ways not heretofore possible. 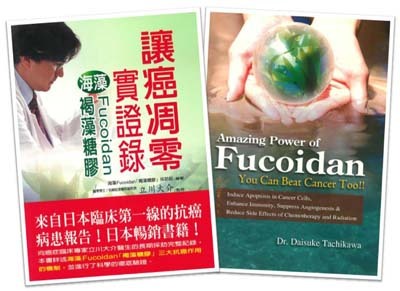 Let's find out more about the amazing cancer-healing power of fucoidan, which even oncologists are acknowledging. This book will explain how fucoidan actually works to cure cancer. To put it simply, fucoidan not only enhances the patient's natural healing power but also "promotes apoptosis of cancer cells." This is indeed its most remarkable function. In other words, fucoidan does not attack cancer cells directly but causes them to "surrender." Of course, fucoidan does not promote apoptosis in normal cells. It only works on cancer cells. Therefore, fucoidan produces no side effects, unlike anticancer drugs, so the patient suffers no additional damage or discomfort. Case File 1: Lung Cancer. Fucodian Saved Me from the Brink of Desperation -- Overcome cancer after being diagnosed with just three months to live! Case File 2: Lung Cancer (Relapse).Recovering from a Relapse of Lung Cancer -- Fucoidan gave me my health back. Case File 4: Bronchial Cancer. Curing Inoperable Bronchial Cancer -- Fucoidan supported my battle at the hospital. Case File 5: Stomach Cancer. Amazing Recovery in Just Two Weeks Waiting for a Hospital Bed -- Completely cured of cancer by outpatient treatment alone, without suffering any side effects from anticancer drugs. Case File 6: Terminal Stomach Cancer. Fucoidan Saved Me from Terminal Cancer -- The most powerful of all health foods I have tried. Case File 7: Stomach Cancer (Stage 4). Coming Back from Inoperable ?Stage-Four Cancer -- Fucoidan taught me not to give up. Case File 8: Stomach Cancer (Relapse). Fucoidan Helped Me Recover from Surgery to Remove a Relapsed Stomach Cancer! -- The anticancer effect that amazed even my doctor. Case File 9: Esophageal Cancer. Recovering from Terminal Cancer of the "Esophagus: Even the Doctors Had Given Up -- One year taking fucoidan gave me a clean bill of health. Case File 10: Stomach Cancer (Proliferate to Esophagus). Stomach Cancer, Followed by Esophageal Cancer -- Cancer eradicated without hospitalization! Case File 11: Colorectal Cancer. My Ten-Year Battle with Cancer -- Fucoidan drove me to the ultimate victory. Case File 13: Rectal Cancer. Single Female Overcoming Rectal Cancer -- Fucoidan cured the cancer completely, even without hospitalization. Case File 14: Liver Cancer. Hepatitis C, Followed by Liver Cancer. Fucoidan saved me from near-death. Case File 15: Liver Cancer. Complete Recovery from Terminal Liver Cancer -- Fucoidan caused cancer cells to self-destruct. Case File 16: Pancreatic Cancer. Miraculous Recovery from Fatal Pancreatic Cancer -- The incredible effect of daily fucoidan therapy! Case File 17: Kidney Cancer. Completely cured of Stage-Three Kidney Cancer -- The secret washome fucoidan therapy! Case File 18: Gallbladder Cancer. Healing inoperable, Intractable Gallbladder Cancer -- Proving the amazing power of fucoidan. Case File 19: Breast Cancer. Defeating Breast Cancer After Futile Treatments at Two Hospitals -- Fucoidan made surgery unnecessary! Case File 20: Uterine Cancer (Stage 3). Beating Cancer of the Uterine Body Where Hysterectomy Was the Only Choice -- Fucoidan guided me to complete health. Case File 21: Ovarian Cancer (Stage 3). Curing Progressive, Malignant Stage-Three Ovarian Cancer -- Fucoidan significantly reduced the side effects of anticancer drugs. Case File 22: Prostate Cancer. Defeating Prostate Cancer that Spread to the Pelvic Lymph Nodes -- All it took was fucoidan. Case File 23: Laryngeal and Pharynx Cancer. Conquering Progressive Pharyngeal Cancer -- I'm glad I didn't do the re-excision, since I can now enjoy karaoke to my heart's content. Case File 25: Testicular Cancer (Stage 3). Curing Stage-Three Testicular Cancer -- Fucoidan suppressed the side effects of chemotherapy. Case File 26: Skin Cancer. Beating Malignant Melanoma Spreading Through the Body -- Success came after quitting chemotherapy to focus solely on fucoidan! Case File 27: Thyroid Carcionma. Curing Highly Malignant Undifferentiated Carcinoma Without Surgery -- Treated relapsing thyroid cancer with fucoidan. Case File 28: Lymphoma. Cured of Malignant Lymphoma that Had Spread Through the Body -- The effect of combining fucoidan with chemotherapy. Case File 29: Leukemia. Recovering from Chronic Leukemia After Being Diagnosed with One Year to Liver -- Fucoidan saved me at the critical juncture! Case File 30: Lung Cancer (Proliferate to Brain). Beating Brain Tumor Metastasizing from Lung Cancer -- The incredible power of fucoidan cureed inoperable neoplasmas! Case File 31: Hypertension. Lowering Chronic Hypertension -- Fucoidan brought my blood pressure down to normal. Case File 32: Liver disease. Complete Healing of a Liver Disease that Nothing Could Cure -- I regained health thanks to fucoidan. Okinawa -- The Prefecture Boasting the Highest Longevity in Japan! Recommeneded Dosage of Fucoidan: 20 Packs of Mozuku Daily? Fucoidan's Powerful Effects on Cancer! Fucoidan Guides Cancer Cells to Apoptosis! Beating Cancer by Enhancing Immunity! Cutting off the Suply of Nutrients to Cancer Cells! Waht effects does fucoidan have? Why is fucoidan effective in treating cancer? I don't like seaweed. Is fucoidan also suitable for me? Are thre any side effects? Can I take fucoidan with other drugs? Is fucoidan only for those suffering from illness? How much fucoidan should I take each day? Where can I buy fucoidan?